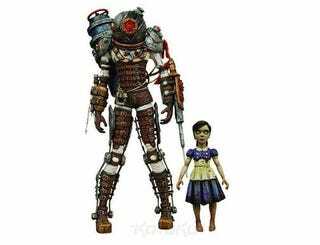 A few weeks back, toy-makers NECA announced a line of BioShock figures, which we didn't post because without pics, the announcement meant nothing. Now that there's pics, though, well, that's another story! Due to be officially unveiled at Comic-Con, there's currently a few figures scheduled: a Big Sister, a Little Sister, a Splicer and a few variants of the Big Daddy. Those waiting for an Andrew Ryan's Office playset, complete with swinging golf club action, will have to wait.